Our Adobe InDesign Course is held 5 minute walk from Birmingham New Street Train station in the heart of Birmingham City Centre. The two day InDesign Course is designed for anybody to become efficient in the industry standard desktop publishing package. Many delegates each month travel from all over the country to attend a variety of our courses as we are only 5 minutes from the Birmingham New Street train station and have plenty of nearby parking for all delegates who attend our InDesign Courses. All of our Birmingham Adobe InDesign Course Training is designed for the busy professional. It is short and intensive, combining demonstrations and plenty of hands-on instruction. Practical exercises carried out under guidance will help delegates to learn the tools and subjects covered quickly and easily. With only small groups all of the delegates get plenty of opportunity to talk to the trainer about their specific requirements so we can tailor the Birmingham Adobe InDesign course to fit everyone’s specific requirements. If you would like more information, course dates or a no obligation quotation for your Birmingham Adobe InDesign Course please fill in the form below and we will get back to you. If you are based in Birmingham and would like to visit us to attend one of our scheduled classroom based Adobe InDesign Courses in Birmingham we have two options, a one Day Adobe InDesign Bootcamp Course or a more in-depth two Day Adobe InDesign Course, on each course page you can find all of the information and breakdown of everything that is covered. We are only 10 minutes from the Birmingham Bullring! For travel information to Birmingham visit Birmingham City Council website where you can find links to bus and rail travel information. So whether you want your Birmingham Adobe InDesign Course delivered onsite at your premises or you would like to visit us in our Birmingham Adobe Training Studio the choice is yours! We can also provide the Adobe InDesign Training as an online course or over Skype with screen share so there really is no excuse not to be getting yourself up to speed with this industry standard design software so you can start producing your own professional documents that can be easily shared online or printed to a high quality. 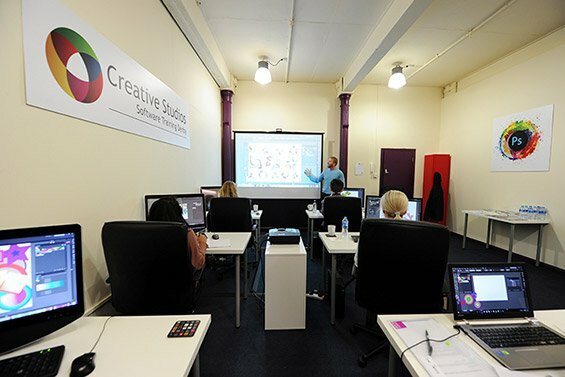 The training provided by Creative Studio has enabled the technicians to keep abreast with the latest software available, giving them more confidence and has increased our productivity. We had a great day and learnt new things which we can now apply in our everyday duties at work. Very helpful. A great course in a fantastic environment – I liked the small number of people on the course – felt like one to one training. Fantastic value for money plus small groups and demonstrations on large screen are much more useful than trying to follow a book or an online tutorial. I liked the live tutorials of the software. Being able to see exactly how to do things was a great benefit, especially when I had purchased several online courses and had got nowhere previously. We all thoroughly enjoyed the course, it was the right length, break times were just what was needed and most importantly the content was enjoyable. I would definitely recommend them to others.